Heat olive oil in a large skillet over medium heat; cook and stir onion until tender, 5 to 10 minutes. 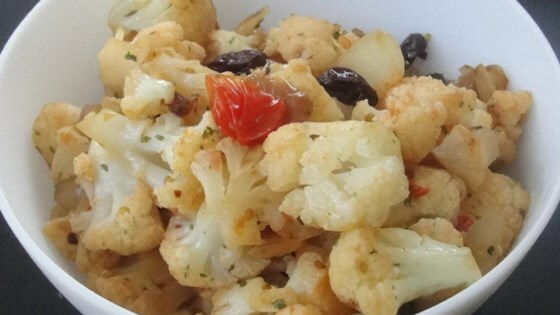 Add cauliflower, cherry tomatoes, raisins, and white sugar to onion; cover skillet and cook, stirring occasionally, until cauliflower is tender, 4 to 5 minutes. Mix garlic, parsley, and red pepper flakes into cauliflower mixture; increase heat to high and saute until cauliflower is browned, 1 to 2 minutes. Drizzle lemon juice over cauliflower. This was super! I used sweet onion instead of red (that's what I had on hand), and halved the recipe as it was just too much for two of us. I will definitely make this again. This is an absolutely wonderful recipe! Very warm feeling and smells so good too. I didn't change a thing which is a first. This is a regular around my house! I use dried cherries instead of raisins and it is delicious! I was really skeptical when I was preparing this dish, but we LOVED it. Unique combination of raisins and onions in this recipe. Great to have a new way to prepare cauliflower! I never use raisons (I don't eat them) but I've made this twice and it gets better every time!